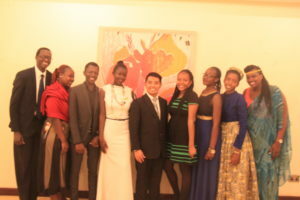 Saturday, August 18, 2018 – World Youth Alliance Africa held her inaugural anniversary dinner in celebration of 15 years since operations begun in Africa. It was a lovely evening as they celebrated with nostalgia the growth that World Youth Alliance Africa has experienced in the past 15 years. 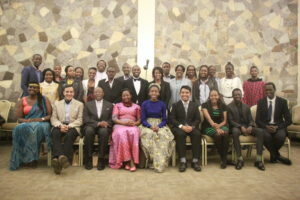 The dinner was graced by many of the founding members and current members of WYA Africa, providing a great opportunity to reflect on what the journey has been and to share experiences. 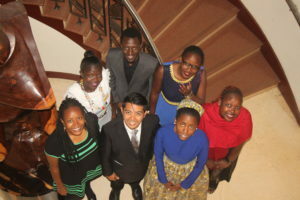 The WYA Africa story on the African continent began in 2003, when a group of young people who had met WYA founder Anna Halpine in 2000 took the bold step to set-up an office in Nairobi, Kenya, which aimed to serve as the Regional Office in Africa. The dinner officially began at 7:00 p.m. After the opening remarks, the guests were served the meal and settled to watch and listen to some of the video testimonials on the history of WYA Africa. They later had the current Regional Director, Kevin Alando speak as the Staff Representative. Later, Hannah Moturi shared about her journey in WYA Africa as a representative of the Steering Committee. Caroline Maingi, who was the first Regional Director, also told a story on WYA Africa’s early days. Oscar Beauttah SS, who has been a long serving Advisory Member, then encouraged the group to continue in leaps and bounds. A moving speech by our CEO Anna Halpine was read by Patricia Gwambo, WYA Africa’s current Regional Director. 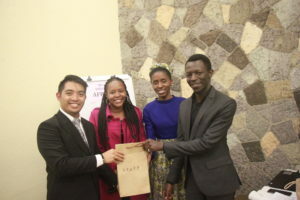 The guests were also encouraged to continue to be willing to meet youth needs by encouraging inter-generational engagement in a brief talk and call to action by Patricia. The Global President Lord Pomperada then wowed the guests with the current global view of World Youth Alliance, bringing into perspective how WYA Africa feeds into the larger success story of WYA. The night’s able emcee, Obeja Roderick, kept everyone engaged throughout the event. The dinner ended at 10:00 p.m. with gifts, an awards session, and a dance. WYA Africa thanks all who continue to support the WYA mission. We’d like to make a special mention to our current partners: the Kenya Christian Professional Forum and the Strathmore Law School. Onward, we continue in leaps and bounds to many more great years ahead!